Apelsa CCA-700 activated carbons are products that feature high capacity for contaminants adsorption. 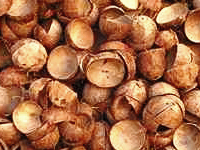 Manufactured from coconut shell they present an optimum micropore volume, which is ideal for small molecules removal. Apelsa CCA-700 Activated Carbons offer excellent results in water dechlorination and organic compounds removal, such as solvents and phenolics produced as a result of animal and plant rotten residues. They are also used to remove trihalomethanes formed as reaction between free chlorine and organic material dissolved in water that are cancer agents. Other applications are: medicinal products purification, alcoholic beverages purification, liquids deodorization and effluent water treatment with low-density contaminants. CCA-700 is very efficient for removal of taste, odor and ozone from water. It may also be used to remove suspended solids. CCA-700 feature high hardness that gives a better resistance to erosion. Can be used in fixed bed or mobile bed applications, with minimum losses during backwashing and regeneration processes. are 8 x 30 and 12 x 40.